So after playing with the settings on the 3d Printer here we have the start of the clock tower in “fine” detail, a resolution of 0.2mm. It looks pretty fab and is really coming together. You get an immense amount of wastage from support material which is a shame and sometimes when removing it (which can take an age) bits get broken so its handy to have a tub of superglue nearby. Also the print time can be some 18 hours (vs 6 hours in normal mode at the same accuracy of 0.2mm) with the immense amount of detail in fine mode – so there is some patience required! 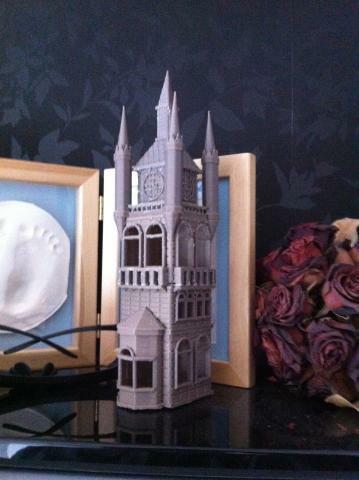 This entry was posted in 2mm finescale, 3d Printing, St Pancras and tagged 3d modelling, 3d printing, 3d UP!, st pancras.